There has recently been some new reviews on the management of eczema. I linked to them in another post but want to go into more detail as MissC has shocking eczema and is the middle of a terrible flare up and as such the myths and pseudoscience around eczema is particularly annoying me at the moment. I understand where it comes from though. It comes from a lack of understanding of the basic nature of eczema. 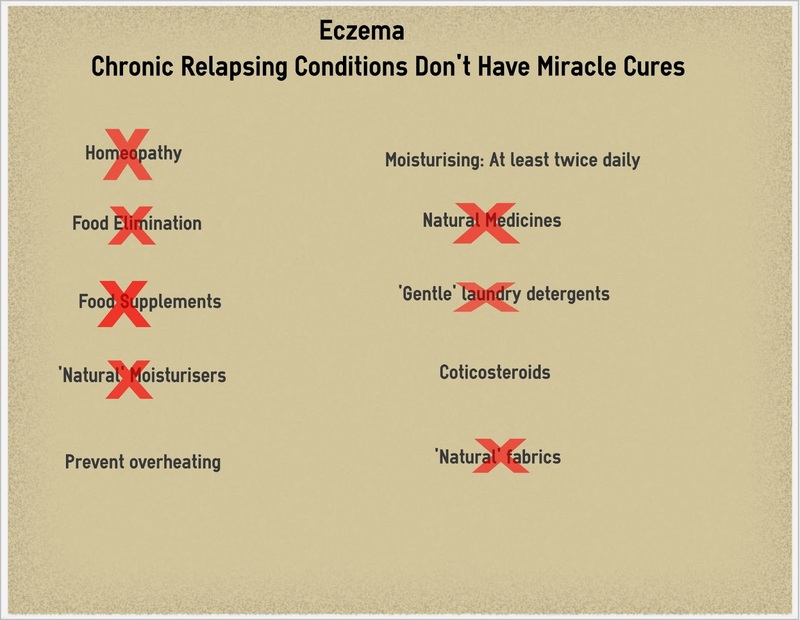 Eczema is a chronic, relapsing condition and there is no 'cure' 1. One delightful moisturising cream company has used this fact to indicate that conventional treatments do not work (obviously their far more expensive cream will). Proponents of their treatment, or any other 'miracle' cure will however be disappointed to learn that flare ups will occur in spite of treatment and with no obvious cause. Here are some of the most annoying, and potentially harmful myths, surrounding it. Topical corticosteroids have more than four decades worth of research showing that they provide effective flare control through a variety of actions 2. There are factors that decrese their effectiveness, including the strength and whether it is in ointment or cream form 2. The biggest factor decreasing its effectiveness however is that people do not use sufficient ointment. The amount being applied to a flared area should be approximately the distance from the crease of your index finger to fingertip (about 0.5g). There are side effects from long term corticosteroid use and for this reason it is advised to use them once a day for a maximum of 14 days in one location when a flare is 'active' followed by moisturisers only 2. If an eczema flare continues for more than 14 days, it is recommended that you see a doctor to ensure that the treatment is appropriate. Some newer corticosteroid preparations have a lower risk of side effects and can be used for a longer period of time 2. When worrying about side effects it is worth remembering the consequences of untreated eczema (infections, scarring) which are much greater than the risk of side effects. Children who are effectively treated are also more likely to outgrow eczema quicker and so will require less treatment overall. There is no evidence to show the effectiveness of any of these treatments. You should always be cautious when using herbal medicines in children, particular Chinese herbal medicines as liver toxicity can occur 2. Regular bathing in warm (not hot) water is important to hydrate the skin and debride any crusts. Soaps should not be used during bathing but a moisturising cleanser should be used instead. Skin should be patted dry (not rubbed) and moisturisers should be applied within 3 minutes 3. There is no diet shown to effect eczema. Elimination diets and food elimination is potentially harmful and should only be done when the child is proven to be allergic to the specific food (by a doctor) 3. Generally it doesn't really matter which moisturising cream you use but you need to use it at least twice daily and oilier preparations are usually more effective 3. 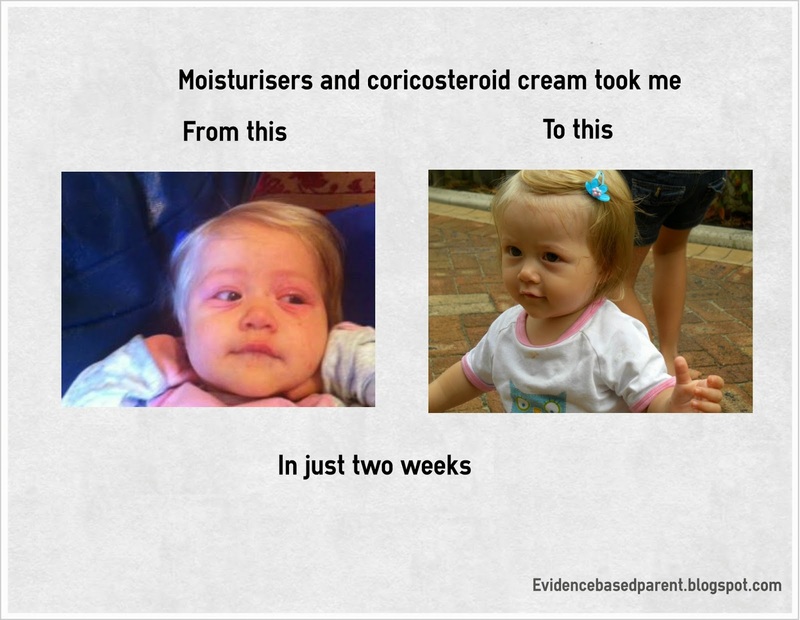 There is some evidence to suggests that creams containing ceramides may have improved results but at present their is insufficent evidence to evaluate this 3. Creams that contain evening primrose oil, oat extract and urea have failed to show any benefits above that of other moisturisers 3. There is little evidence suggesting that laundry practices effect eczema 3. Children with eczema should not be dressed in any textile that they report irritates them. However studies have found that itching and discomfort is related only to fibre weight and roughness and not the textile they are dressed in 3. In some cases dust mites, pollen or pets may trigger eczema flares but there is little evidence to suggest that routine avoidance contributes towards its management 3. Stress and psychological factors do appear to influence eczema however their impact is limited 3. Provide them with adequate moisturisation: The most important thing you can do is prevent skin dryness as this can contribute to the inflammation. Creams will do this better than lotions and you should avoid soaps and shampoos that can dry out the skin 1. Moisturiser should be applied at least twice a day even when the skin is clear and after swimming or bathing. Many people do not use sufficient quantities, a child should be using about 250g a week. Moisturisers should also be smoothed onto the skin rather than rubbed in.